Kids' parties sometimes have entertainers geared at doing all sorts to keep children occupied: magic tricks, juggling and so on. I don't know about you, but I'd much rather have this awesome Japanese robot doing the entertainment at parties than the typical human act. The folks over at Chinba University demonstrated how one of its hand-arm systems can juggle two balls at once--single-handedly and extremely fast--at the IEEE International Conference on Robotics and Automation. The research is inspired by the way humans have the ability and skill to juggle balls, and hopes to transfer this sort of talent to robots. 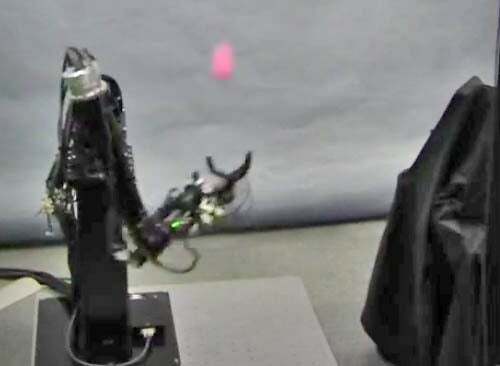 Due to how dexterous the robotic arm is, it can move in an almost human-like manner, which aids its juggling ability. What makes the arm even cooler is that it's rigged up to a high-speed vision system, which allows it to plan for every catch and throw. When we say high-speed, by the way, we're talking 500 frames per second. Sadly there is a slight catch: Since it lacks a shoulder joint, the robot can only manage about five cycles before it drops a ball. This is because the robot can't get to a ball if it drifts slightly, either due to the environment or the way the robot throws the ball in the first place. Of course, the researchers are looking into ways of improving the juggle bot's technique with new ways of throwing the ball. They are also hoping to add in more balls to the robot's act, and then other complicated variants of juggling. Not bad for a metal arm!